15 Sep 17 - The RHC is trying to assist in gathering tentative numbers of those who might attend the 2018 UK International Rigger Reunion. There are actually two separate reunions planned, a 5 day and a 10 day. Please see the attached document for the itineraries. They are asking for a response (non-binding) if you plan to attend either of the 2018 Rigger Reunions - deadline of 31 Oct 17. Please help their planning process and submit the paperwork if you plan to attend. Read the itinerary here. 5 Jul 17 - SGT John Skipper of 1st Battalion, 91st Cavalry Regiment, 173rd Airborne Brigade Combat Team in Vicenza, Italy, was formally charged in May for his role in the dangerous destruction of the three vehicles. You can read the full article here, or view the original source here. There is a video of the incident on Youtube if you care to watch - caution, there is adult language. 29 Jun 17 - Representatives of the Quartermaster School and Army QM Museum unveil a statue paying tribute to parachute riggers during a ceremony June 26 at the museum. The lifelike bronze casting depicts a rigger standing at a long table arranging suspension lines. Click here for entire story, or here for the original source. 26 Mar 17 - I found an article in the Sep 2016 of Car and Driver titled, "Dropping Democracy: How the Army Yanks a Humvee Out of a Plane and Drives It Away 750 Feet Later". It breaks down airdrop for non-Riggers. Check out the article here, or view the original source here. 6 Mar 17 - We received a copy of Clipped Wings, from Nick - the President of the Australian Air Dispatch Association (Riggers). Please note that there have been some changes to the 2017 International Rigger Reunion due to the low number of people attending. View their newsletter here or visit the original source here. 23 Feb 17 - We received an email of urgency from Nick, president of the AADA, concerning the International Rigger Reunion currently scheduled for 21-25 Aug 17. If you plan on attending please use this link to register ASAP. 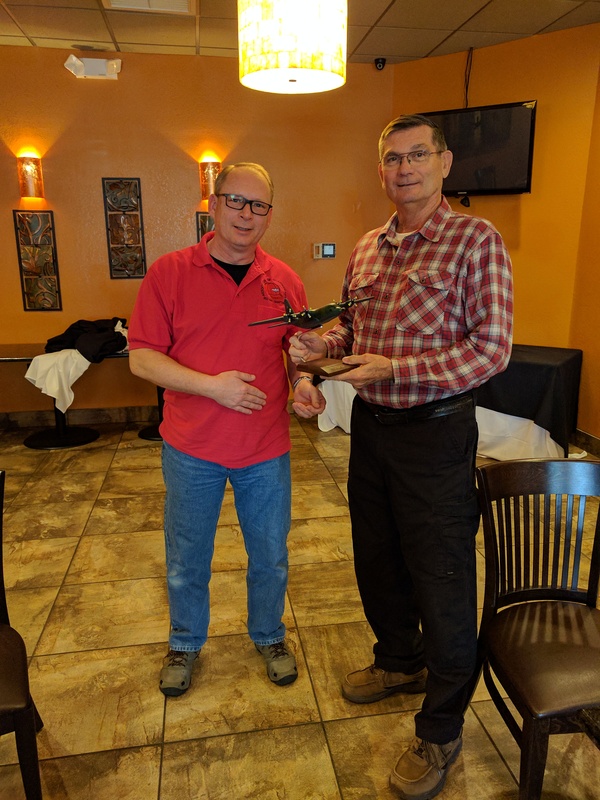 21 Jan 17 - At our monthly luncheon, The Red Hat Chapter said goodbye to our Quartermaster, Gaylin "Jess" Jesmer. This is sad, because Jess was the only Quartermaster the RHC has ever had - other than perhaps Del in the earliest years. Jess is moving out of state and building a home in the great Northwest with his wife. Thank-you for your many years of professional service and friendship with all the Chapter's members. Good luck on all your future endeavors!